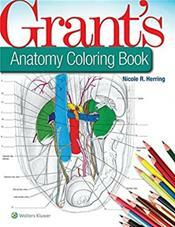 Grant's Anatomy Coloring Book uses an interactive approach to help students deepen and reinforce their anatomical knowledge. Integrating visual and kinesthetic learning activities with an efficient, high-yield review of essential information, it's the perfect way for students to deepen their grasp of the anatomy they need to know for their courses, labs, and exams! Combines realistic, dissection-based illustrations from the award-winning Grant's Atlas of Anatomy with descriptive text highlighting key features such as attachments, innervation, and relationships. Prompts you to identify important and relevant structures in each coloring-book illustration, with additional structures pre-labeled to help you achieve orientation and recognize key relationships. Presents structures regionally, in the same sequence in which they are revealed during dissection. Follows the same chapter organization as Grant's Atlas of Anatomy and Grant's Dissector . making it easy to use in conjunction with these authoritative resources.